NEW DELHI, India, February 18, 2015 (ENS) – Prime Minister Narendra Modi told a conference of investors in renewable energy from India and across the world that his government is emphasizing renewables to light the homes of millions of India’s poor and change their lives for the better. 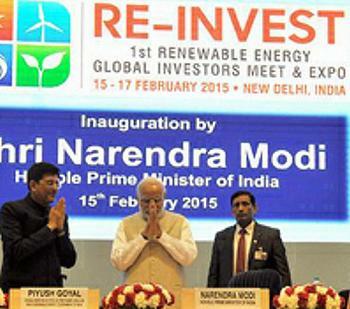 The Prime Minister opened India’s first Renewable Energy Global Investors Meeting and Expo, Re-Invest 2015, Sunday in New Delhi. The three-day gathering, which closed Tuesday, was aimed at scaling-up financing for renewable energy. Modi stressed the need to focus on renewable sources of energy like solar, wind and biomass to reduce greenhouse gas emissions. He called for research and innovation in renewable energy and an effort to manufacture renewable energy equipment in India. The Prime Minister said India is working towards evolving a consortium of some 50 countries “that are blessed with abundant solar radiation.” Modi said he is encouraging this group to pool research and technical advancements in solar energy, to improve its accessibility to the poorest of the poor, and in the remotest of locations. Michael Bloomberg, the UN Secretary-General’s Special Envoy for Cities and Climate Change, Tuesday joined renewables and investment professionals at the Re-Invest conference, as part of a two-day visit to India during which he advocated for increased renewables, smarter cities, sustainable transport and urban climate adaptation. 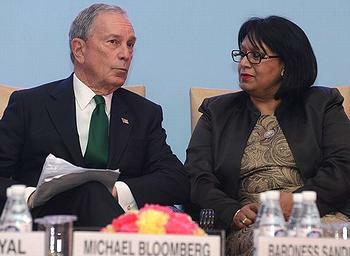 Bloomberg, who was mayor of New York for 12 years, arrived at the conference in a rickshaw powered by compressed natural gas, a cleaner alternative to the petrol that makes Delhi one of the most polluted cities in South Asia. He told conference delegates that most of the world’s total carbon emissions stem from cities and sources like buildings, transportation and waste, over which at least limited control can be exerted. Welcoming India’s efforts to confront climate change, Bloomberg said the country is well placed to capitalize on the benefits of renewable energy. “The fact is, people want to live in cities with clean air and water, good public transportation, and streets that are safe for walking and biking. And where people want to live, businesses want to invest,” he said. “The good news is, as Prime Minister Modi is showing, confronting climate change goes hand-in-hand with smart economic growth. And from my experience, he is absolutely correct to make cities a central focus of his work,” said Bloomberg. With countries coming to Paris this December to reach a new climate change agreement, Bloomberg said that no country will commit to goals they don’t think they can reach, or that come at too great a cost to economic growth. However, countries are continuing to move forward because they realize the benefits of action – for their economies and the health of their citizens. For instance, next year, India plans have completed the world’s largest solar power plant in the Rewa district of the state of Madhya Pradesh. 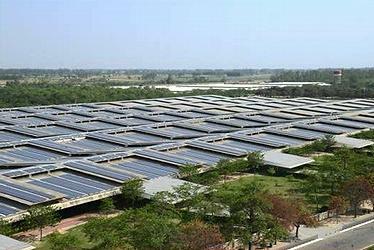 The state government is establishing the 750 megawatt plant in a joint venture with the Solar Energy Corporation of India. In the next four to five years, Goyal said, the government plans to enhance the electricity transmission and distribution infrastructure to create a seamless grid across India. Prakash Javadekar, minister for environment, forests, and climate change announced that environment clearances for green energy projects will be given top priority. He said the government would provide a predictable policy regime with standard guidelines for approving renewable energy developments. Re-Invest 2015 concluded with 266,000 megawatts worth of commitments to a range of green energy projects.